An adorable yellow duck is sure to catch the attention of everyone. 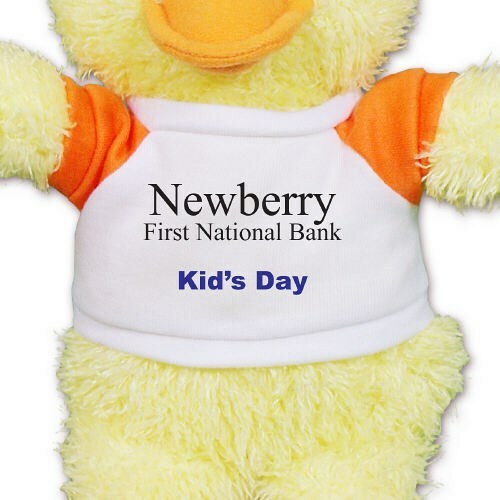 Add personalization to this stuffed animal’s T-shirt and promote your business or special event. Each promotional duck makes a great advertising giveaway item and is loved by all who receives it. The Ruddly Duck measures 10" in height and is made of polyester fibers and pellets. The personalized t-shirt is available in white or with a white center and colored sleeves. We offer a variety of ink color options. The Ruddly Duck allows for a three line custom message and artwork image. Most orders ship within 7 business days. Please note that these items may ship separately from the other items on your order. Please allow 2-3 business weeks to receive your items. Rush, Express and Urgent delivery is not available. Additional Details Personalized Promotional Plush Animals and Giveaway Stuffed Animals from 800Bear.com feature affordable prices and additional volume discounts on large orders. 800Bear.com produces the finest Personalized Promotional Bears for each and every client. Please note that due to shipping large volumes of plush animals shipping charges may be increased prior to shipping. One of our customer representatives will contact you if shipping costs should increase.